HOPE considers the latest classroom construction a breakthrough in their advocacy since it addresses two main concerns: education and the environment. “Eco-bricks provided us with the unique opportunity to upcycle thousands of plastic bottles per classroom, so we have committed to using them in all of our builds starting 2018,” said Joie Ann Balaong HOPE program officer for education. The well-ventilated and lighted Starbucks classroom is made of sturdy eco-bricks using recycled plastic to provide students with a safe and conducive learning environment. Students of Archbishop Emilio Cinense Memorial Integrated School in San Fernando, Pampanga thank Starbucks and Friends of Hope for the gift of a new classroom. Friends of Hope, Starbucks and school officials lead the unveiling of the new classrooms. 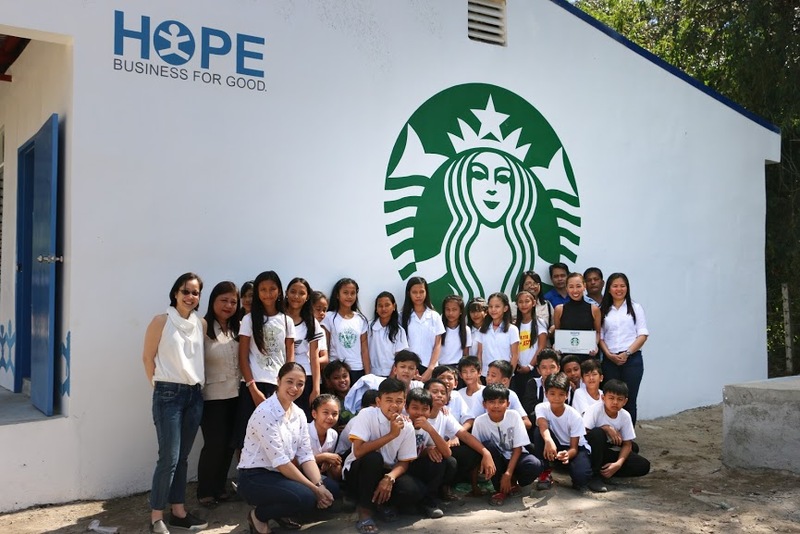 Photo shows (from the left) GenerationHope Inc Commerical Director Bambi Defensor, Starbucks Philippines marketing manager Jo-Ann Ramos, Starbucks Philippines category manager Jamie Silva, Starbucks Philippines assistant category manager for food Celine Lichauco, and AECMIS principal Felisa Cabaobas.